Cut off the tops and bottoms of the onions and remove the exterior skin. Cut the onion in half and peel the layers apart, keeping the biggest layers to stuff with meat. Setting the onion layers aside, mix the ground beef, diced onion, parsley, mushroom, brown sugar, condiments, and bread crumbs in a large mixing bowl by hand. Place a handful of the meatloaf mixture inside two of the onion layer pieces. Wrap the onion meatballs in bacon, using three slices per ball. Secure the bacon with toothpicks to keep it from unraveling during cooking. Bake in a dish at 425 °F for 40 minutes. Cover the balls in BBQ sauce and bake for an additional 5 minutes. 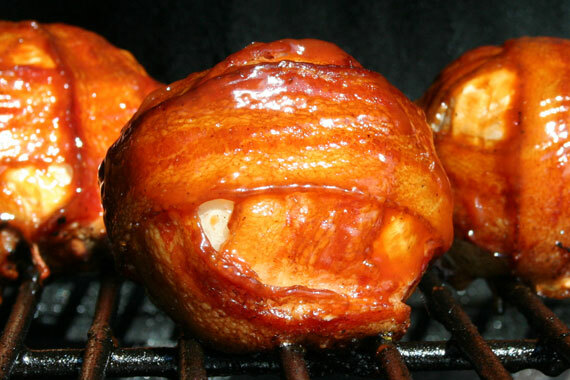 The result will be the perfect addition to your summer party — a bacon meatball onion bomb that is both sweet and savory! There are many variation you can try with this dish. The first this we did was mix some cajun pord in with the ground beef.